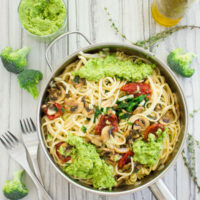 A fragrant broccoli pesto infused with garlic, olive oil and basil, dolloped over fettuccine pasta with sun-dried tomatoes, mushrooms, more garlic, and pine nuts. It’s a burst of freshness combined with pure comfort in every bite! 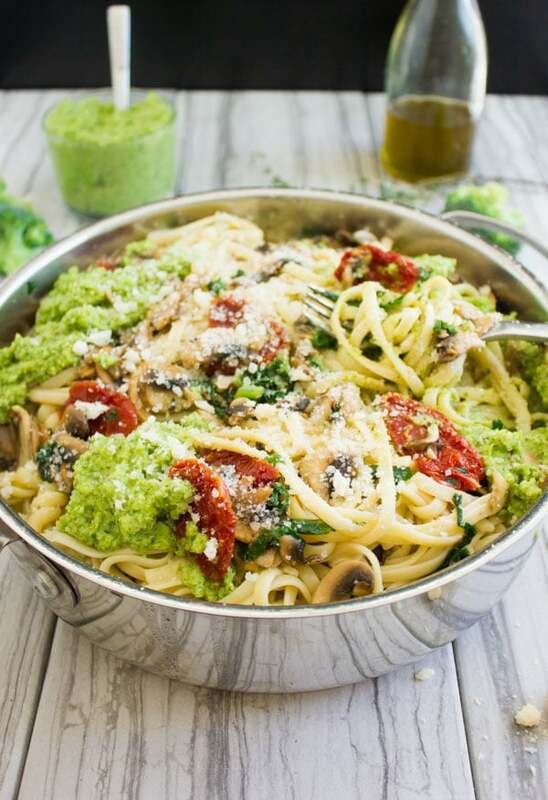 If you’re a pasta lover, you need to make this healthy Broccoli Pesto Pasta Recipe. It’s hands down one of my favorites and it will soon be yours! Yaay for pasta dinners! I know it’s quite obvious, but can I just say, I really LOVE pasta. Pasta dinners, pasta sides, pasta everything! And for some weird reason, I don’t have that many pasta recipes on the blog, so things are about to change here. This change comes in form of a simple, healthy broccoli pesto pasta recipe. The truth is, I’ve been missing out on good food like a bowl of pasta with homemade pesto lately. As you know I’ve finally moved from my high end tiny pretentious condo in downtown to the suburbs. You know I moved so much in my life, it’s not even funny! If I tell you I grew up living in 14 different countries across the world, you might think—how cool!, But I say it with the same knot in my stomach I got every time I moved from country to the other. From one home to the other, one school to the other, one culture to the other. Ok but this time I’m moving literally 30 mins away from where I live, it doesn’t even compare to any of my previous moves—why does it still feel the same? This time I’m moving for my own comfort, not because I have to like every other time. I’m moving because, while my downtown condo was as fancy as could be in a high-end hype location, with all amenities and services, we simply didn’t belong there anymore. Today what I’m trying to say is, with this move—I’ve been trying not to give in and eat out every day while I get the kitchen in shape and organized. 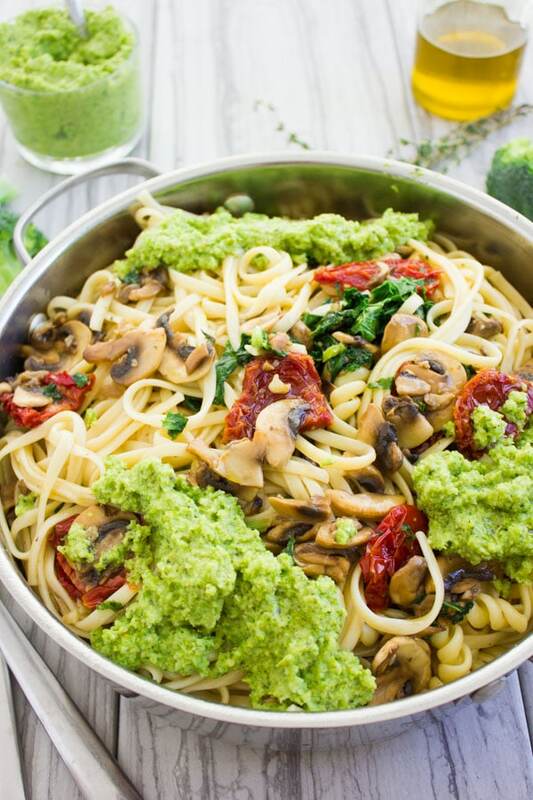 This healthy pasta recipe with homemade broccoli pesto is proof that simple is best! And this easy pasta dish is SOOO much better than ordering or eating out! It tastes fresh and light, but rich in flavor and texture. And this healthy pasta recipe has solved a huge argument I continuously have with my husband. He claims he has nothing against broccoli, but every time I make it or he finds it anywhere, he won’t eat it. He argues it’s almost always under-cooked for his taste, I argue who eats their broccoli mushy in this day and age anymore?! So I give in and “mush” it up, he still eats minimal of it. 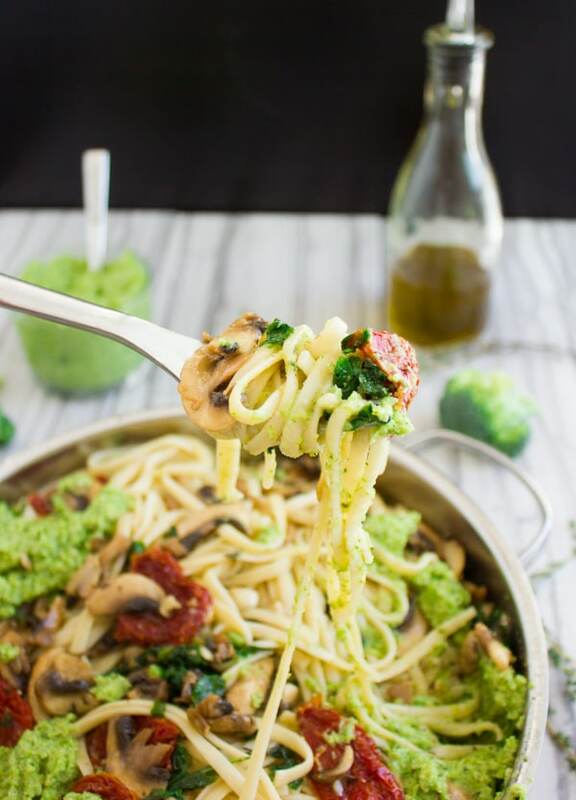 One magical morning this healthy pasta with a broccoli pesto CLICKED in my mind and it was magic, like PURE magic! So, the other day, I was craving that comfort meal but I didn’t feel like any sauces. And I had quite a bit of broccoli. My plan was to make a broccoli pesto and have it with some healthy pasta with garlic, sun-dried tomatoes, mushrooms, and toasted pine nuts. Well I had frozen broccoli (which I think is very slightly partially cooked). I pureed it in the food processor with a bit of garlic, basil, thyme, lemon juice and olive oil. It became a smooth blend of flavorful broccoli. Now the healthy pasta recipe became a flavor-packed pasta recipe! And guess what? The Mr. tasted the broccoli pesto and kept adding more and more on his pasta. Then he declared this broccoli pesto is now his absolute favorite way to eat broccoli!! And I declared this has to be one of my favorite pasta dishes ever!! While we cook the pasta according to the instructions on the package, we make the pesto. Pulse the broccoli and everything else for 2 minutes until smooth. Then you’ll simply sauté garlic, mushrooms and sundried tomatoes with thyme and olive oil. Once the pasta is cooked, you’ll add it to the mushroom with a bit of the pasta water to create a sauce ( I explained this before in my 10 Min Greek Cheese Tortellini recipe). Try this Skinny Eggplant Parmesan Pasta, Healthy Kale Squash Mushroom Pasta, Summer Pasta Salad with Sweet Tea Dressing, One Pan Creamy Mushroom Tortellini and Speedy Lamb Ragu Pasta. Cook your pasta according to package directions, but check it a minute or two earlier, to make sure it’s still al dente. Make sure not to brown the garlic too much, as this leads to bitterness. When assembling the dish, add the hot pasta water very slowly, stirring in between, to avoid a runny sauce. 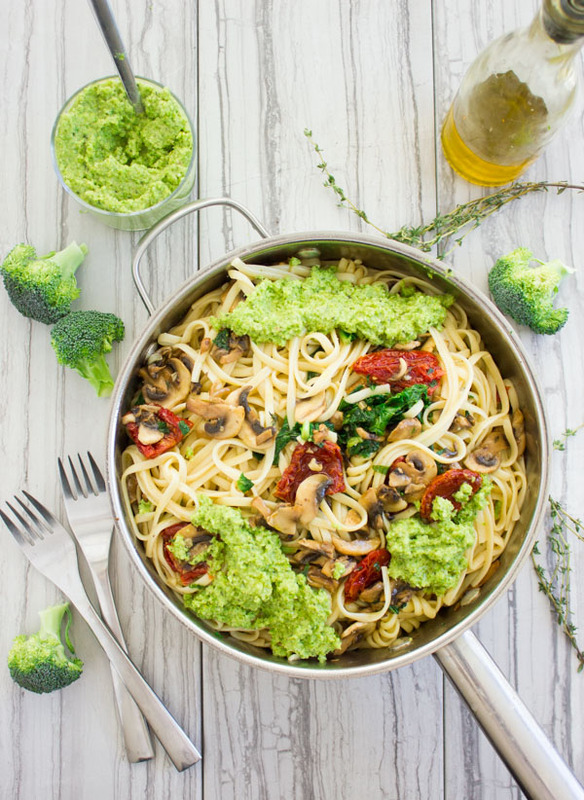 If you’re a pasta lover, you need to make this Broccoli Pesto Healthy Pasta Recipe. It’s hands down one of my favorites and it will soon be yours! 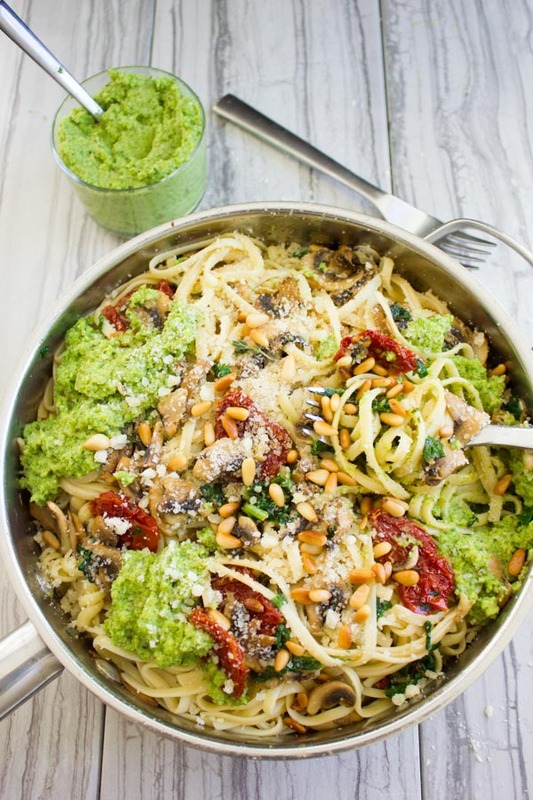 A fragrant broccoli pesto infused with garlic, olive oil and basil, dolloped over a quick pasta sauté with sun-dried tomatoes, mushrooms, more garlic, and pine nuts. While the pasta is cooking, make the broccoli pesto by blending all ingredients in a food processor until smooth. Taste and adjust seasoning. Make the Sauce by heating the olive oil in a sauté pan, then add the minced garlic and sliced mushrooms. Sauté for 2 minutes, add in the kale, thyme and sun-dried tomatoes with salt, pepper, and red pepper flakes for another 2 minutes. Turn off the heat. Once the pasta is ready, remove it from the hot water (reserving at least 1 cup of the pasta water) and add the pasta into the mushroom pan. Toss the pasta well with the mushroom mixture and then add in the reserved pasta water gradually ( 1/4 cup at a time, while tossing with every addition) until your sauce is the desired thickness. Cook your pasta according to package directions, but check it a minute or two earlier, to make sure it's still al dente. Thanks so much Taylor!! You will enjoy this so much!! Daphne, so sorry for this!!! I hope you made it, I usually throw in the sun dried tomatoes with the garlic. I just love this idea! I’ve had broccoli and sun-dried tomatoes together in several recipes, but never with the broccoli as part of the pesto! So fun! What a cool idea to make pesto from broccoli! I love it! Hannah, it’s cool and delicious too!! 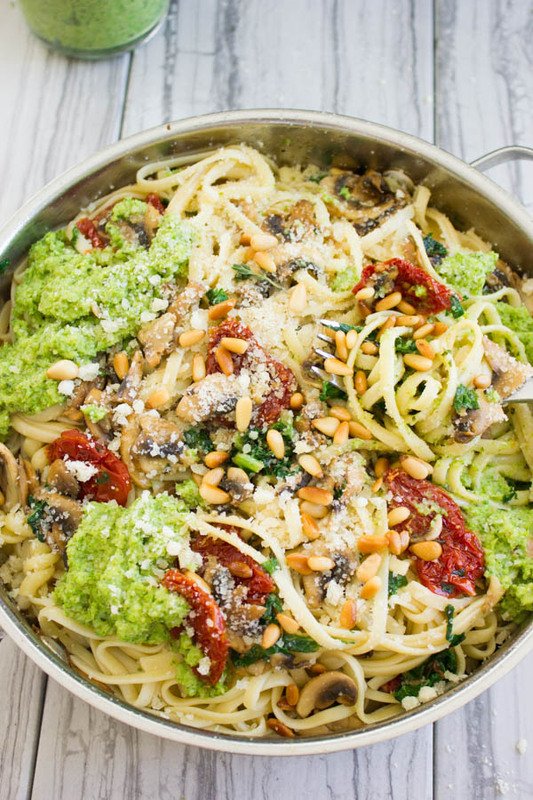 The pesto looks crazy good. I have some slow roasted tomatoes that I can sub for the sundried. Yum! What a great way to get veggies into your diet, especially for those picky eaters! I think I know a few people who could benefit from this. 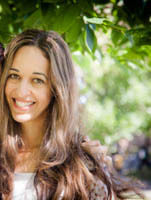 Tell me about picky eaters!! Wow looks very tasty! And I want to make these asap. Great idea for dinner. Its fantastic! YUM! This looks so delicious! it’s a perfect meatless dinner! I know how you feel — I’m a nester and I like being surrounded by my own things. And it is a wonderful way to get your veggie, using broccoli as pesto and adding it to pasta. Great recipe. Pesto flavored is my absolute favorite. Love the colors on this pasta. It’s so good that you added broccoli to the pesto. I’ve tried variations but never broccoli. Yum. I guess it should be on your list Veena! I’ve never made a pesto out of broccoli, but I really want to try it now because broccoli goes over so well in my house! This looks so full of flavor and perfect for a comforting meal you don’t have to feel guilty about! Jenni, my husband hates broccoli yet he loves this pesto..so that says it all!